Operating embroidery business over 30 years, Dah Jeng’s philosophy relates to customer service-oriented- listen more, care more, and think more than customers do. We have been winning a lot of partners’ trust and support. Furthermore, a long-term business with our customers was established firmly. Embroidered badges we produced to our overseas customers and sell to more than 70 countries. Dah Jeng Embroidery Inc. was established in 1983 as a leading manufacturer and exporter in embroidery industry. Our president, Mr. Tony Yang is the founder and chairman of Taipei County Embroidery Association, who always takes the responsibility to constantly upgrade local embroidery manufacturing expertise. With two factories in house, sites located in both Taiwan and Jiang Su China, are capable to maximize the productivity and meet customer’s demand. The factory located in Jiang Su is with over 9,000 square meters and around 150 experienced workers. All workers are well-trained to perform as professionals in both factories. Head-office is located in Taipei. Excellent sales teams, experienced artists, skillful embroidery machine operators, strict Quality Control Personnel, and excellent sales teams gathering work as an unconquerable team. We create unsurpassed quality and offer premium service to our customers globally. To produce various embroidery products to our customers around the world. Laser cut machines, heating pressing machines, printing machines and 40 units advanced Tajima embroidered machines are used in our factories. Our ultimate goal is to become a sustainable operated, and world-known corporation. Our 30+ years in the embroidery industry has given us experience becoming an expert in custom products and customer service. The most important managerial principle of our president, Tony Yang, is that we should always tribute our success to our customers. Think like our customers and always find the best solution for them. We believe only customer-oriented companies can last forever. Our sales dedicating in this field for over decades, will always give our customer the most unforgettable service. Undoubtedly, we are all professional no matter in judging quality or providing thoughtful services. You can always bombarded our sales with numerous questions, especially for beginners, and they will always give you a delighting answers. We are proud to say that we can always exceed our customers’ expectations. Our well-trained art team, who has been in this industry for decades, can always bring your imagination come true. You can just give us simple sketches, actual images, or even just some vague ideas. Our artists will figure out what you really love and create the designs for you. The most amazing part is, it’s all for free! Dedicating in the embroidery business for such a long time, we have the most experienced digitizers who can always give our customers world-top performance. Mostly, it takes almost 3-5 years to train a digitizer to professional levels, let alone our digitizers have devoted their lives for decades practicing and upgrading expertise day by day. Moreover, we use the latest high technology digital programs, and the best embroidery machines from Japan. There is no way for you to find such a good quality and service with such reasonable price. To win over other suppliers, we strive to apply embroidery to all kinds of products, not just traditional patches. That’s why we can open the door to promotional products. Customers who visited our booth at business shows are all impressed by our new ideas and innovated technics every time. How honest we are? You can tell by the truth that thousands of customers have faith in us and have been working with us as long-term business partners for decades, not just years. Our factory launched its own brand ‘ TKE’ in China. 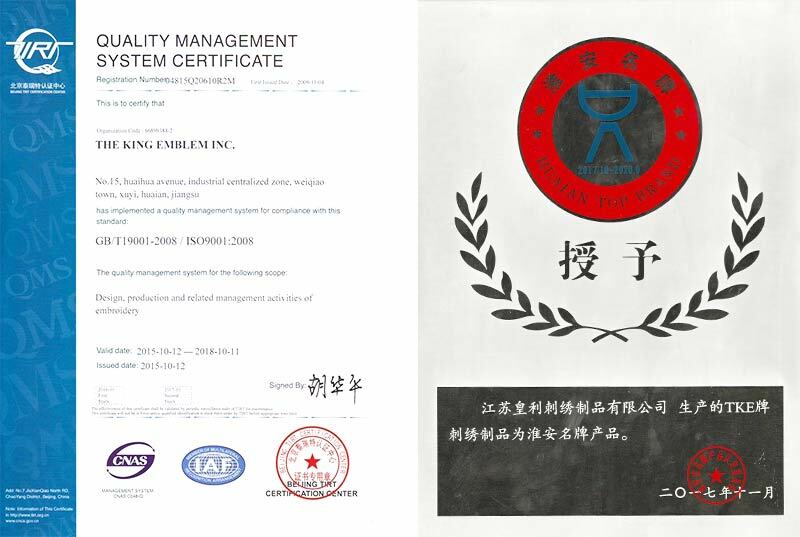 In 2017, our own brand ‘TKE’ accredited as HUAIAN TOP BRAND which is granted by local government in China.